I’m gutted that I can’t make the Audrey Hepburn exhibition at the National Portrait Gallery (day trips on the train to London are virtually impossible when you’ve got a three-month old) and have been perusing the online shop on their website to make up for it. 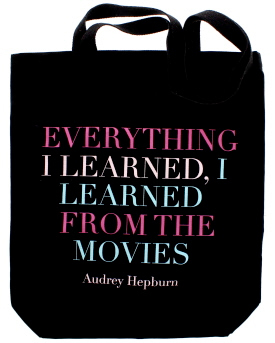 I love the quote on this tote bag – it’s so me! It’s also a very reasonable £12.00. And that’s not all, there’s plenty on the site, including a poster, catalogue, set of Cecil Beaton postcards and a bio. I have several already but this cover is rather adorable. And you know I’m a bugger for judging a book by its cover!